Imo State governor Rochas Okorocha Monday said he regretted supporting Adams Oshiomhole to become the National Chairman of the All Progressives Congress, APC, adding that he did not properly understand that the man’s name is “Oshi and Ole”. The governor spoke at the Orlu Township Stadium built by his administration when he flagged off his Campaign for the Orlu zone Senate Seat election on Monday, February 4, 2019 stating that he had supported the National Chairman not knowing the full meaning of his name. His words “My finishing governor is not a full-stop. It is a comma because after every comma, a sentence will follow. Those who are afraid of me politically have ganged up to fight me, including the person I supported to become the National Chairman. That is why they brought Hope Uzodinma. He is not running for any election but was only recruited to fight me in my Orlu zone”. He said “Please ask Osita Izunaso what he has been able to attract to Orlu zone for the four years he spent at the House of Representatives and four years he spent as a Senator, not even a bungalow was attracted to Orlu zone, so he should go and sit down. Who has Izunaso trained to become a person in Orlu zone? 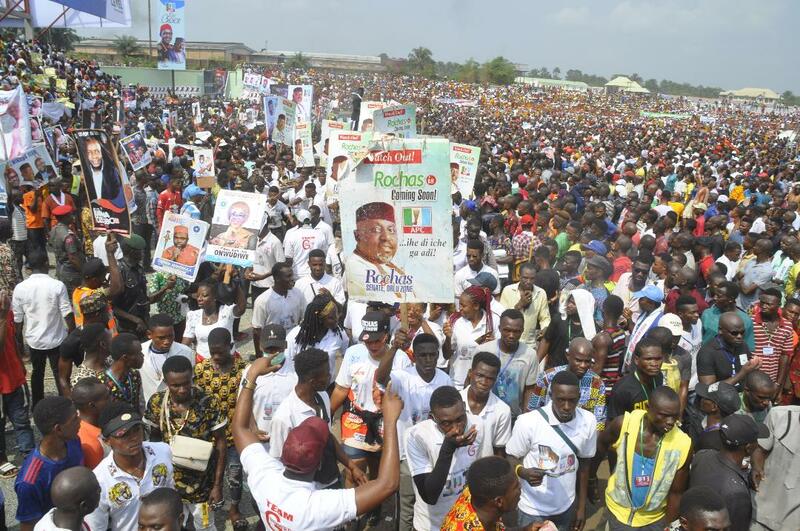 When Rochas who has trained over 5,000 people in Orlu zone speaks, he should keep quiet. Jones Onyeriri wasted 8 years in the House of Representatives without attracting anything to Orlu. Orlu people have seen the light and will never be deceived again”. The governor remarked “I am very grateful to all of you, I have never seen in my life a Senatorial Rally taking the shape of a National Rally. The crowd here is intimidating and has humbled me. What I understand is that you are saying to me Rochas carry go, you are saying to me, go to Abuja”. He continued “Let me re-emphasize that there is only one thing you can do for me. One, on the 16th of February as you come to vote with your PVC, I request as your Servant Leader that you vote President Muhammadu Buhari as the President of Nigeria. President Buhari when he started this journey chose Umezuoke as his running mate and later chose Okadigbo before choosing Osibanjo lately. If Buhari did not like Ndigbo he wouldn’t have chosen Ndi-Igbo as his running mates. After voting Buhari, you vote for Rochas Okorocha for Senate”.